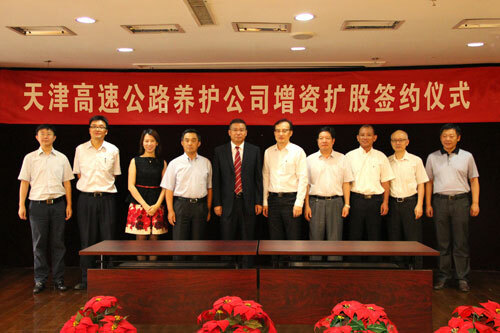 HONG KONG, July 2, 2015 - Freetech Road Recycling Technology (Holdings) Limited ("Freetech", or the "Group;" stock code: 6888), a leading and fast-growing service provider in the asphalt pavement maintenance industry using "Hot-in-Place" recycling technology, announced that on 30 June 2015, Freetech Smart Road Recycling Engineering Investment Limited ("Freetech Smart Road"), a joint venture established by Freetech and China Ocean Shipping (Group) Company ("Cosco"), one of the world's leaders in the logistics industry, has successfully entered into an agreement with Tianjin Expressway Group in relation to the capital injection into Tianjin Expressway Maintenance Company Limited ("TEMC"), which is the first merger and acquisition case in the China's expressway maintenance industry. Freetech Smart Road will invest total consideration of approximately HK$60,000,000 to acquire 55% equity interest on TEMC. As a strong expressway maintenance company, TEMC administrates the maintenance of 14 expressways with a total mileage of over 900 kilometers, including expressway of Beijing-Shanghai, Beijing-Tianjin and Tianjin-Taiyuan. TEMC has requested a comprehensive requirement on the capital injection investor including its capital strength, business operating ideas, professional technology and management level. With a strong allied power, Freetech and Cosco won the final biding and became the new controlling shareholder of TEMC through capital injection. This merger and acquisition has wider impact on the demonstrating purpose. The reformation on the China's highway maintenance industry is ready and the Ministry of Transport is promoting reform measures such as "separation of road ownership and road maintenance" on highway and service outsourcing. The successful of Freetech's merger and acquisition on TEMC is an ice-breaking move for the reformation, which opens the mixed ownership reformation in China's express maintenance industry. And it will undoubtedly bring a major reformation to the whole industry and a new platform for Freetech's rapid expansion and development in the future. Mr. Sze Wai Pan, Chairman of Freetech, said, "We are truly excited about this significant capital injection. Following the Completion, the Target Company will become an indirect non wholly-owned subsidiary of the Company and its financial results will be consolidated into the Group. We believe it will facilitate the Group's financial performance, and will enhance the competitiveness of the Company in the PRC and help promote the development of the Company's business of road maintenance in the PRC."